SBS Insurance Services provide an effective gateway to claim resolution for household and commercial claims. As a leading claims fulfilment company they provide services across all commodities. 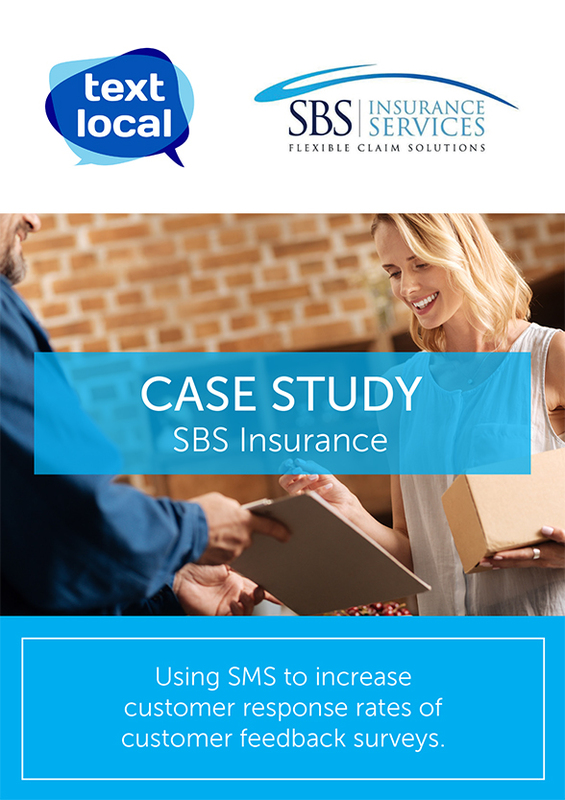 SBS already used the Textlocal Email to SMS service to provide delivery updates for replacement items, and needed a way to increase response rates of customer feedback surveys. Textlocal’s Forms & Surveys tool was an ideal solution, combining sophisticated survey tools with the unparalleled open rates of SMS. With the support and advice of SBS’s account manager at Textlocal, a survey was developed and accompanying message text generated. A number of API gateways are used by SBS to make the survey process more convenient for them. The Send SMS gateway is used to automate survey sends, whilst the Get Survey Results gateway helps to sort the results into SBS’s CRM software. SBS generated a 17% click through rate on their mobile surveys and 9-10% response rate, considerably higher rates than are achieved with email or direct mail.